Do you own a business, condo, apartment or home in Boston’s Back Bay and are in need of roofing services? Aqua Barriers Inc. is proud to serve the many residential and commercial property owners of Boston’s Back Bay neighborhood. With over 25 years of industry experience, you can trust our team of highly trained individuals to deliver the best service to your roof. Aqua barrier’s works closely with manufacturers, property managers and owners to help create a comprehensive and customized strategy for your individual roofing needs. Properties in the Back Bay as well as all over Boston depend on their roofs for more than just a protection from the elements. 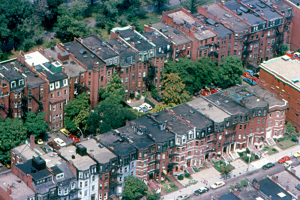 Roofs around Boston are often used as another source of outdoors space, taking advantage of the flat structure, often building decks and other accessible areas. Aqua Barriers works closely with many different types of roofs but was founded to ensure the leak-free protection of flat roofs. In 1986, President of Aqua Barriers Timothy Wider founded Aqua Barriers Inc. determined to prove that flat roofs do not have to leak. Today we specialize in single-ply membrane installation with a commitment to leak investigation and customer service. If you own a property in Boston’s Back Bay in need of fast, reliable and efficient roof contact Aqua Barriers today!